About half of People’s Party lawmakers established a preparation committee to create a new party and held a meeting of promoters on Sunday, speeding up the breakup of the center-left opposition party. 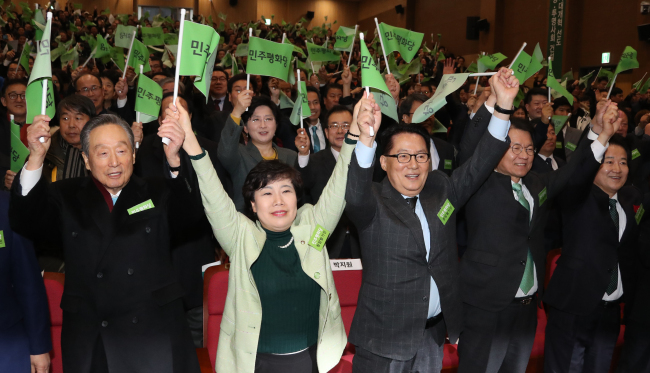 Sixteen parliamentarians, including veteran lawmakers Reps. Park Jie-won and Chung Dong-young and some 1,000 supporters gathered at the National Assembly held a ceremony and proposed the creation of a new party, the Party for Democracy and Peace. “We decided to leave because we could not agree with the party’s drive to merge with the old conservative faction that denies democracy and peace,” Rep. Cho Bae-sook, who was elected to lead the preparatory committee, said at the meeting. “We wish to walk a new path and will create a party that promotes a multi-party system and reforms for a democratic and peaceful society,” Cho said. The lawmakers who are member of a faction closely associated with the late former President Kim Dae-jung vowed to promote a bolder engagement with North Korea and expand welfare policies for ordinary citizens. According to the group, a total of 2,485 people listed their names as promoters of the new party. They will inaugurate the new party on Feb. 6. Only an hour after the ceremony, People’s Party Chairman Ahn Cheol-soo and supporting lawmakers held a party meeting and agreed to suspend the membership of 179 party members, including the 16 lawmakers and Rep. Lee Sang-don who has delayed joining the faction opposed to the merger in order to maintain his position as the speaker of the upcoming party convention. Previously, Ahn and center-right Bareun Party Chairman Yoo Seong-min had announced a joint statement to promote political reforms, practically declaring the two parties’ merger. The People’s Party plans to hold a national convention on Feb. 4 to approve the union. The People’s Party currently holds 39 seats, while Bareun Party has nine in the 299-member National Assembly.